Chuck Norris doesn't read books. He just stares them down until he gets the information he wants. ^ Norris, Chuck; Hyams, Joe (1988). “1”. The Secret of Inner Strength; My Story (1st ed.). Boston: Little, Brown and Co.. p. 6. ISBN 0-316-61191-3. ^ a b c Norris, Chuck; Ken Abraham (2004). Against All Odds: My Story. Broadman & Holman Publishers. ISBN 0-8054-3161-6. http://www.amazon.com/Against-All-Odds-My-Story/dp/0805444211/ref=sr_1_1?ie=UTF8&qid=1437169730&sr=8-1&keywords=Against+All+Odds%3A+My+Story&pebp=1437169732447&perid=0KAFYMCY404AKKPGFV3E. ^ a b Chuck Norris – Strong, Silent, Popular. The New York Times. (September 1, 1985). ^ Justin Bieber Loves CHUCK NORRIS! 2012 The Hollywood Gossip - a celebrity gossip and news site. ^ McLane Leadership in Business Program The George Bush Presidential Library Foundation. 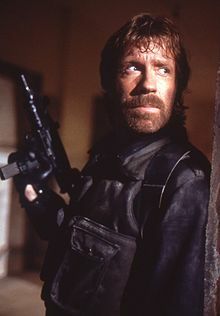 ^ Fact: Chuck Norris is coming to Asheville for Actionfest アーカイブ 2011年8月23日 - ウェイバックマシン Asheville, N.C.